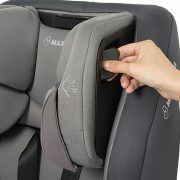 The Maxi Cosi Luna is a 6 month – approx 8 year fully harnessed car seat that has a RRP of $549.99. 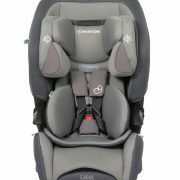 When it comes to safety, function, practicality and style the Maxi Cosi Luna checks all the boxes. Safety is of up most importance when it comes to our babies. Below are the main features we love. Air Protect which in brief is designed to shield your child’s head from side impact forces through the precise release of air. Amazing! WORLD FIRST adjustable side headrest. Now if you drive frequently with your baby or child in the car this is perfect. It helps to prevent head droop when your baby falls asleep. This is a great feature that can and will be used for the whole 8 years you have the seat. Especially if you going on holidays in the car. Dual action buckle and crotch adjustment. 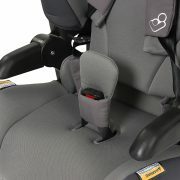 This ensure the perfect fit for your growing child all the way through the seat use. 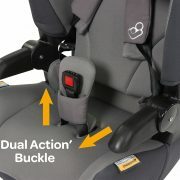 Also some children love to play with the buckles on their car seats and Maxi Cosi have also thought of this, the buckle is in pouch that covers it to help prevent those curious fingers. 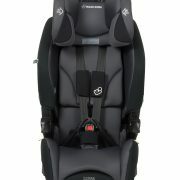 Maxi Cosi Luna Warranty & Accident Exchange policy is fantastic. If you have any questions please let us know or come in-store for a full demo.